The Teacher Dad: The Teacher Dad: How to navigate the political landscape in your classroom. The political landscape today is tough for educators to navigate. We feel restrained by the truth that public school teachers are NOT to be vessels for political messages. We are encouraged to stick to content, and only bring up current events if applicable to what is already planned for the classroom. As a math teacher, I see how easy it can be for teachers to stick to curriculum avoiding conversations that could ruffle the feathers of students and their parents. There is always a little voice in the back of my head reminding me that I have to toe-the-line when it comes to voicing my own opinions regarding world politics. However, there is another voice that screams the truth.. "I became a teacher to be a positive role model to the kids in my classes!" Because, in my mind, my ultimate goal each day is to be a positive force for my students. My entire philosophy of education rests on building relationships with students by creating the trusting atmosphere students need to take academic chances. If they feel safe with their classmates in the learning environment that I'm in charge of, then they will be willing to open themselves to the mistakes needed to learn. I'm good at this. My students trust me, and feel safe.. But now the world they look to outside of the school walls feels crazy to them. And who do they come to?.. I feel like I led you to the answer, but if you missed it.. they come to me or their trusted teachers. But we're trapped in the expectations of what a teacher should be.. and it isn't a person that talks politics with the students. However.. I'm a smart guy, so I'd like to share with you the 3 ways you can deliver a positive message of acceptance, safety, and hope to the students without crossing that political line us teachers are advised not to cross. 1) Fairness: This may seem like a no-brainer to the best of us, but holy hell there are plenty of teachers that are simply not fair within their classrooms. At this point, it is vital that teachers display fairness to all students in every class each day. I make it a mission to discuss fairness with the students regarding decisions I make on how I grade things, how I accept late work, when I'm available for additional help, AND in maintaining order in the class. Every kiddo is treated the same respectful way, because that is the right way, NO the only way to handle things. In doing so, I'm demonstrating just how safe my classroom is for each person. That everyone is allowed the same opportunity for success, and that if someone is struggling it's up to us all to help. Because that is what fairness is. Helping others won't take away or hurt your grade. You'll still get that A, but now someone else has a chance for an A too... because you helped. 2) Creativity: This one is a little tougher at times, but work to find ways that the students can express themselves within the content area. Find ways the students can write more stories, do more art, make a song, write a play.. something that can get their creativity working. Especially in math class! Get them doing problems where they need to create something. Instead of a quiz one week, have them express their knowledge in a creative way. How can they show me they understand a concept by using an artistic form? This is an amazing way to shift the playing field for some of the students. Suddenly, those great quiz takers are having to re-think things and see their classmates in a different way. The artists thrive in getting to be the lead in a project that showcases their talents and highlights a different way to understand the math we're doing in the class. It's important to shift the lens sometimes, and finding ways to build creativity makes that happen. 3) Exploration: I've changed my teaching style over the years. I was once the typical direct instructor, but that doesn't really get the students to think. We need thinkers, problem solvers, and team players right now. With that in mind, my classes are asked to work in table teams to explore the new content together in place of me rambling on for 40 minutes. I create a set of problems that the students start with guiding them to understand the material. For example, when it came to solving systems of linear equations, they quickly learned that finding the point where two lines cross is easy with a given graph. But what if they had to find that point without a graph? What would they do? The table teams created their own methods. They figured it out using what knowledge they already had, and then problem solved. I KNOW.. right?! How cool. And yes, they figured out substitution, and then I blew their minds when I showed them elimination! But they were pumped to have done it on their own first! They critically thought out how to solve a problem together. They didn't just take what I gave them, and vomit it back on a page for me. They owned the problem and solved it! 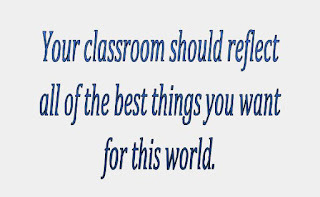 Ultimately, own your classroom, and make it a safe place for everyone to take chances. 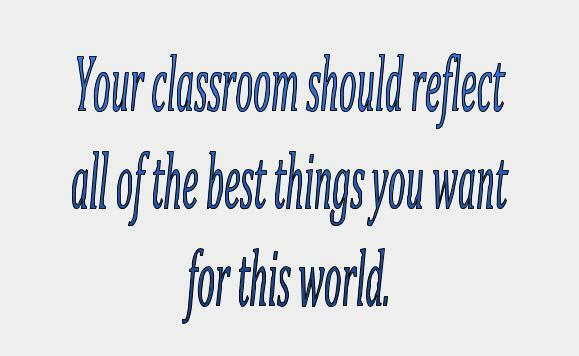 Your classroom should reflect all of the best things you want for this world. I do all that I can to model what life should be like when my student leave. And, I encourage you to focus on the same, because that is what our students deserve. Please use the comments section to share a story about a teacher that was your positive world influence. The teacher that you knew was working to make things better by simply being fair, creative, and exploratory with your learning. And please share this post with your teacher friends. We're all in this together, and someone might need that reminder. Thank you!